Recently, I’ve taken up Yoga and I’m just drinking it up. Not sure if I’ll ever stand on my head, but I’m loving it as an exercise and a way of playing in the physical with a spiritual edge. As I settled into the pose, I really paid attention to how I felt. So strong, empowered with energy! Very aware—just me and my body, a body that was relaxed yet alert and ready to respond to whatever was next, whatever internal or external stimuli that would cause the next. Driving home after class, filled with that feeling of power, (and passing the dojo where I used to workout) I flashed back to when I last felt that good, that secure-in-myself-and-in-my-body feeling. 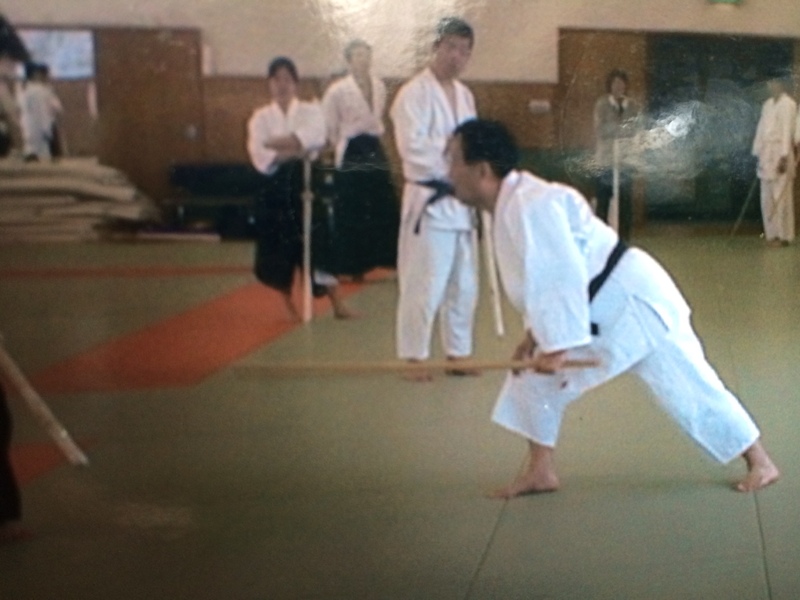 I was back in the turn of the century, some 16 years ago and I was deep in my Martial Arts Phase, especially Kashima Shin Ryu (KSSR) Here’s the link: http://www.kashima-shinryu.jp/English/index.html. Here’s a picture of Seki Humitake, the current headmaster of the school in Japan and all the satellites throughout the world. 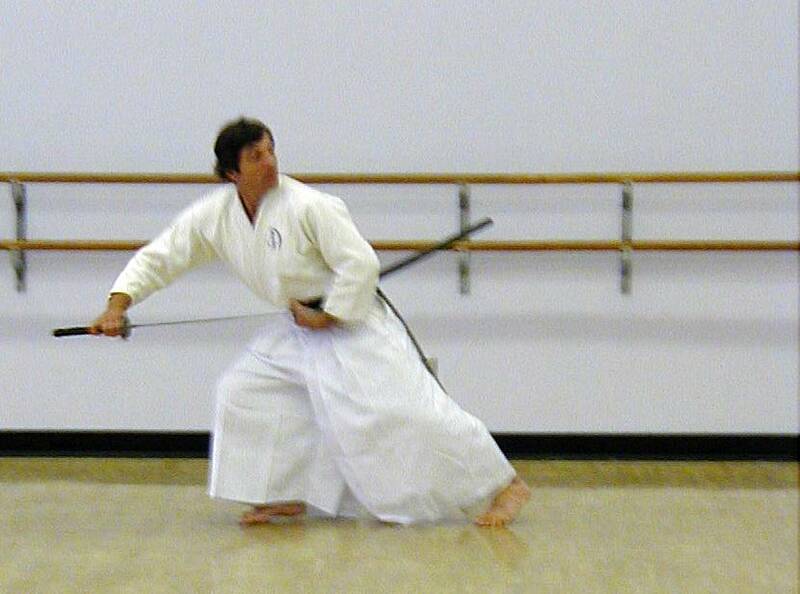 The forward leaning stance. Very much like Warrior 2. Effortless. Motion and Stillness as one. 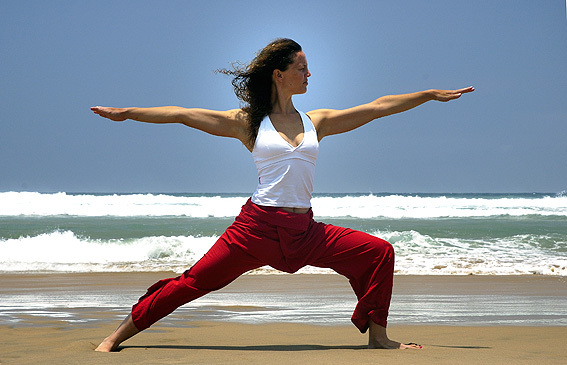 The Warrior 2 Pose gave me the exact same feeling as I had with a wooden practice sword in my hands in a forward leaning stance. With an alert body ready to respond to whatever internal or external stimuli that would cause the next. 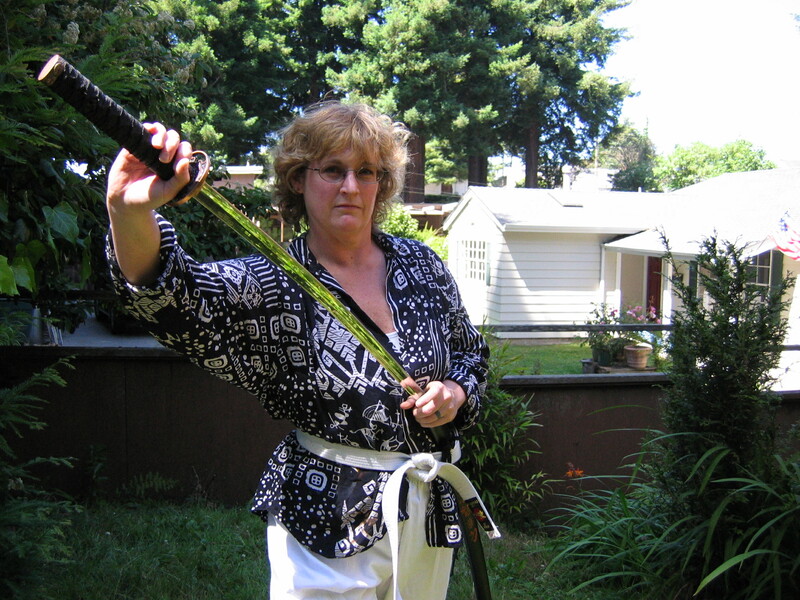 I’ve retired my sword. (Okay, I admit, I do take it out and cut some kesas when nobody’s around to get hurt). But I still own that feeling. That’s what I learned yesterday. 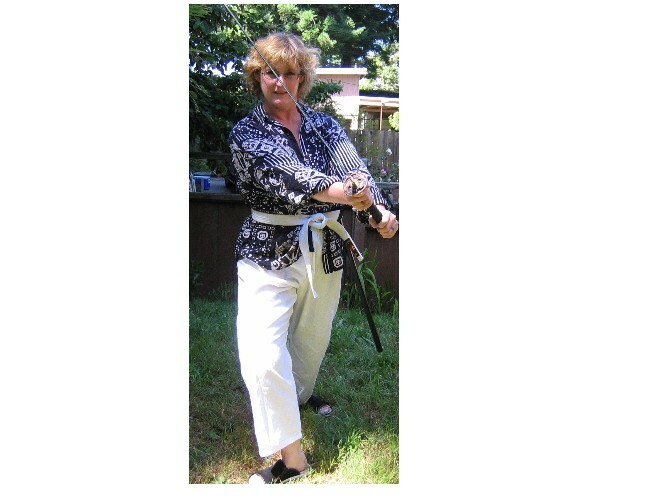 My martial arts phase was many years ago and I’m no longer that woman. But rather than yearn for those days, I can own them and claim them for my here-and-now. So, embracing the black belt that I earned, I’ve a more peaceful way to express my warrior nature, a state of being I strive for daily. “Strive” being the key word, here. And what an awesome way to be, don’t you think? To be relaxed, ready and awake in the here-and-now, alert and ready to respond to whatever internal or external event causes the next? Of course, when I got home, I had to take a trip down good ol’ Memory Lane. And you’re not getting away from the show and tell! 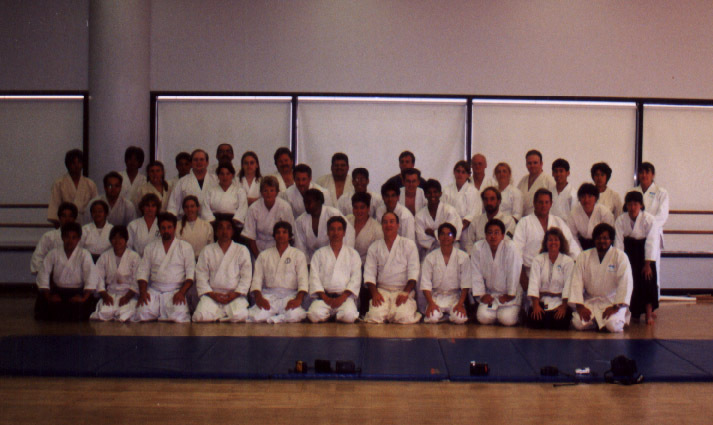 August, 2001–KSSR Gathering in LA. I’m in the 2nd row, third from the left. 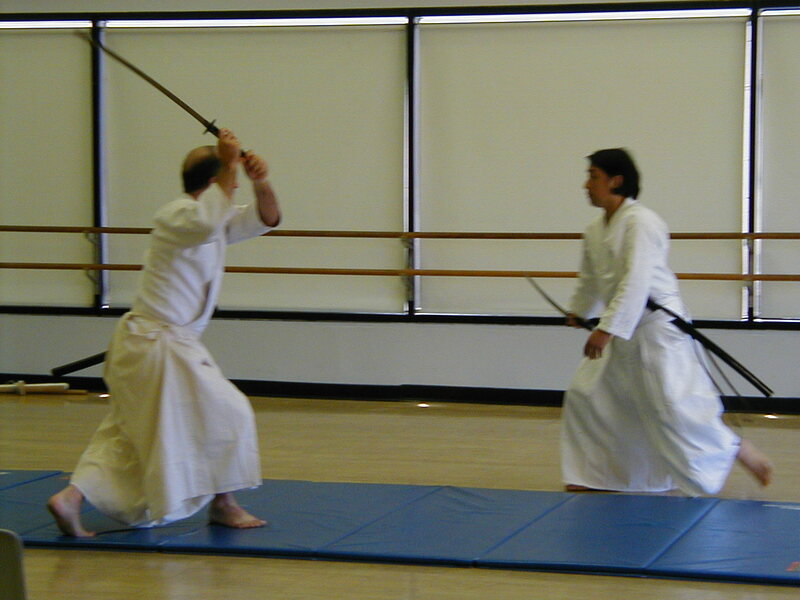 A demonstration by two of the Kaiden. We all got excited when the live blades came out. One gets VERY present when putting the sword back into its scabbard. Powerful! One of your best…and I love the last comment. That’s a whole ‘nother blog post, IMHO.